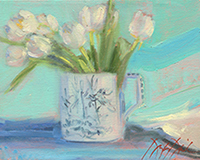 A return of last season's highly successful and very popular class will cover the basic principles of oil painting with regard to painting florals, and still life - fruits and vegetables. Includes interesting and memorable discussions on composition, massing, building form, light and shadow: and depending on your own style, knowing when a work is finished (learning how to not overwork your painting). Douglas really delivers sound principles of painting that are an incredible foundation for your painting, whether a beginner or seasoned professional. After the brief morning intro, a very hands-on approach to the class, gets students mixing colors and preparing to paint. Students will work in their own style/technique so that the finished work is their own. Douglas will overview his palette and concepts that his work entails. Students will mix paints and learn to mix basic strings of color to help comprehend how this preparation makes the painting process a little simpler and gets a working understanding of the value/strings of color. Students will paint from Sunflower, Hydrangea, Tulips and some tropical floral that is available at this time of year in Central Florida. A few fruit and vegetable still lifes-with arrangements of bowls and china plates and bold graphic table coverings, with strong side lighting make for a wonderful alternative subject to the florals.The thought Douglas puts into these classic arrangements and timeless subjects is as important as the painting itself. He will show you how he does it and why he makes the choices he does. A discussion on the pitchers, vases and vessels he chooses along with the cloth and fabric samples he uses will be included. An incredible 3 day hands on painting experience will yield a good number of paintings and a logical thought process in a fun yet focused atmosphere to help you guide your future study. Your paintings can be as complicated or as simple as needed. Demos and individual discussions/instruction will help each student to start to begin to reach the preliminary goals they are striving to meet. Plan to produce several studies and at least one or two larger, more finished paintings, depending on skill level. Plan to bring notebook/sketchbook and enjoy some demos along with some great stories to help you remember the principles that are the foundation of Douglas' teaching. A small informal group show on easels in our class will end the class on a high note as we share our accomplishments in this condensed time of study. A return of last season's highly successful and very popular class will cover the basic principles of oil painting specifically with regard to seascape painting. Very focused on nothing but seascape makes this class a one of a kind and rarely offered. Painting out-of-doors, en plein-air will be a major focus of the study after the basics are covered. Discussions and lectures on basic composition, massing, building form, light and shadow, near and far, capturing and developing atmospheric distance, building the anatomy of the wave and depending on your own style, knowing when a work is finished (learning how to not overwork you painting). Students will work in their own style/technique so that the finished work is their own. Douglas will overview his palette and concepts his work entails and specifically and very focused on painting the beach and the surf. Students will mix paints and learn to mix basic strings of color to help comprehend the preparation/set up to prepare to paint out-of-doors. Students will work on small canvases and the emphasis will be on capturing the time of day, atmosphere and geographical elements along the coast in a quick concise way based on the covered principles. Douglas will help students pare down equipment so only the necessities are taken to the beach. The same beach will be the basis for all 3 days, so Douglas can show repeat areas of study as well as various viewpoints based on time of day. Depending on the skill level of each student, students are able to grow and develop at a rate that is to their comfort. Demos and individual discussions/instruction will help each student to begin to reach the preliminary goals they are striving to meet. Plan to produce several studies and at least one larger painting. For those students from last year, work on a really large painting from last year's smaller ones as Douglas is taking us back to the same beach with that idea in mind. Plan to bring notebook/sketchbook and enjoy some demos along with some great stories to help you remember these principles that are the foundation of Douglas' teaching. Douglas has a “suitcase of supplies” he brings along, it includes some recommended books, and some supplies in case a few students need a few items that are forgotten. Douglas also will offer a "BASIC PAINT KIT" (while supplies last) which includes all the basic oils, brushes, palette knife, palette and canvas panels and medium for those who do not want to buy these supplies individually. You would need to bring some paper towels and rubber gloves. Call the venue for pricing of this kit. Afternoon: On location - Paint seascape/study (A1A to 46th place - near 7/11 & CVS) First afternoon will help everyone get familiar with painting on the beach.